In a room crowded with reporters, facing microphones and cameras, Eskimos coach Jason Maas served up the same answer Tuesday that he delivered moments after his team lost to the Calgary Stampeders. "There was a fork in the road," he said. "You could take one direction. I chose the other direction." 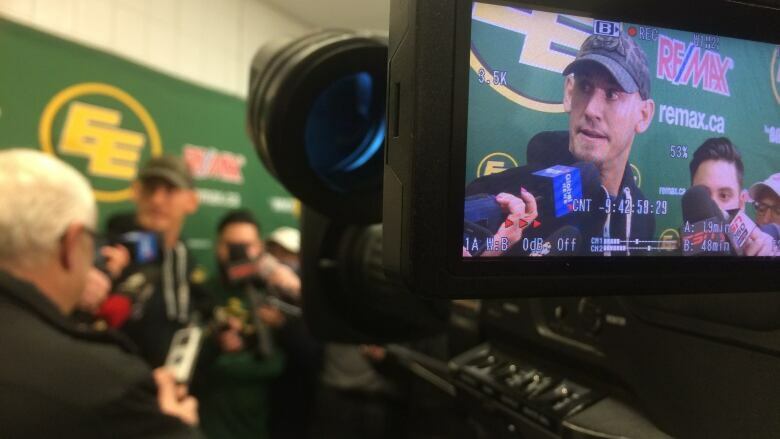 In a room crowded with reporters, facing microphones and cameras, Eskimos coach Jason Maas served up the same answer Tuesday that he delivered moments after his team lost to the Calgary Stampeders. "There was a fork in the road," Maas said. "You could take one direction. I chose the other direction." Down seven points with under two minutes to go in Sunday's Western Final, Maas thought about gambling and going for the tie. Instead, he chose to kick a field goal in hopes his defence would get the ball back and give quarterback Mike Reilly a shot at a winning touchdown. It didn't play out that way. Edmonton's defence did stop the Stamps and forced them to punt the ball back. But kick returner Jamal Smith fumbled the ball and the comeback was snuffed out. "I believe wholeheartedly it was the right decision," Maas said. "Now, because it didn't work, it lends itself up for criticism." Maas said he has heard the chorus of calls for him to lose his job, and the second-guessing about what he should have done. "I have big ears, I can listen to a lot of things when I want to," he said. "But I can also choose not to listen." "At the end of the day, I love the passion of our city, and I love the passion of our fans. I'll choose to listen to that later. But right now I just wanted to focus on our season, saying goodbye to my players and not having to focus on all of that." The planning for next year is already underway, as Maas held exit meetings with the players. One of them was Reilly, who admitted the loss hurt but said the team will learn from its mistakes and move on. "When they're (coaching staff) going to make a decision during the game, our job is to go out there and execute based on those decisions the best we possibly can," Reilly said. "And as a team, we didn't do that well enough. "Had we done what we wanted to do at the end, we would have had the ball back with a chance to score to win the game," said Reilly. "And it just didn't work out that way. Calgary executed better, and that's the way it turned out." As for the flurry of calls on social media to have Maas fired for his decision, there's none of that talk at Commonwealth Stadium. Maas will be back as the head coach and has the full support of his players, and general manager Brock Sunderland. "If he has a conviction about something, I trust that if it works out we're on a flight to Ottawa right now," said the team's rookie GM. "So it's easy to second guess when it doesn't work out. "What he did controlling this environment with all the injuries we had, where we lost six games in a row and no one went off the rails, that comes from leadership," Sunderland said. "I've had exit interviews the last two days and I can't count the number of players that verbatim said, 'I would run through a wall for him.' So I think that summarizes everything of who he is, and the belief that he has in this locker room."